Reviewing the entrants in this year's awards program again revealed the commitment designers and engineers make to pursuing perfection. Whether finessing aesthetic details or implementing big-picture technological innovations, original thinking was evident in all categories. This time around, I had the pleasure of sharing the judging responsibilities with Mervyn Kaufman. 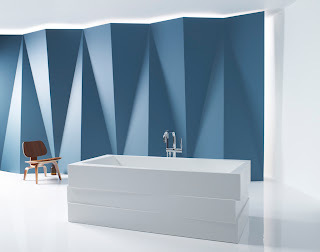 As colleagues at Kitchens & Baths magazine, Merv amazed me on an annual basis as he orchestrated the creation and construction of the Design Idea Center, an installation we staged at the Kitchen and Bath Industry Show that used off-the-shelf elements in boundary-stretching ways. As always, it bears mentioning that not all of these products are available right now; some will be released in the coming months, and all will be offered by the end of the year. As recognized here, I can assure you they're worth any wait. And so without further ado, I'm very happy to present the recipients of the 2011 KBCULTURE Awards. Congratulations to all. The mortise-and-tenon detailing of this cabinet line, as well as the sumptuous grain of the oil-finished walnut and rift-cut oak, is meant to be appreciated in the round, making it ideal for open-plan kitchens. The collection assumes a no-boundaries approach to the design process, too, drawing aesthetic influences from creator Susan Serra's Danish heritage while being fabricated in America. 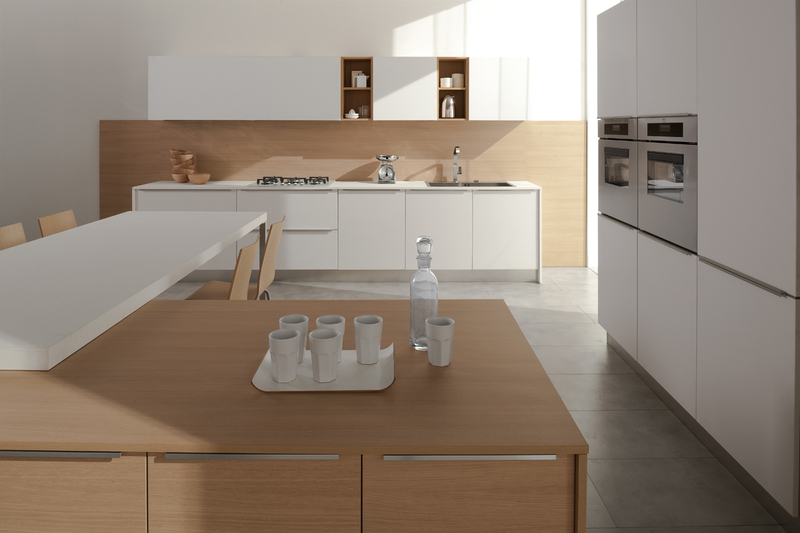 With its tremendous capacity for customization—a palette of nineteen lacquer colors, dramatically textured woods and a full range of standing and hanging cabinet units—the Seta kitchen offers exceptional potential for self-expression. Mix a pale, rough-faced oak on the base cupboards with glassy wall cabinets or keep everything chicly matte; it's all good. 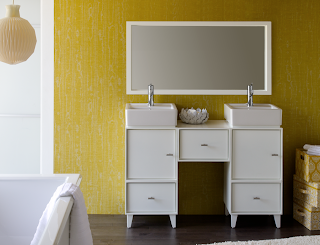 From rolling trolleys to open shelves to mirrored medicine cabinets and vanities, this collection of forty-four pieces is spectacularly flexible, able to institute order in bathrooms large or small. 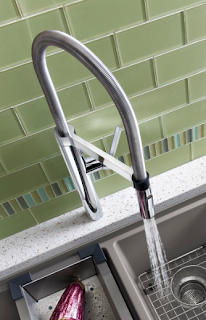 The aluminum strip handle is finger-friendly, thanks to its generous opening. Colors include White, Basalt, Graphite and Garnet Red. These ingenious modules let you compose your own storage. Single drawer units and cabinets in 16- and 24-inch widths can be collaged around corners or up and across the wall, as you please. 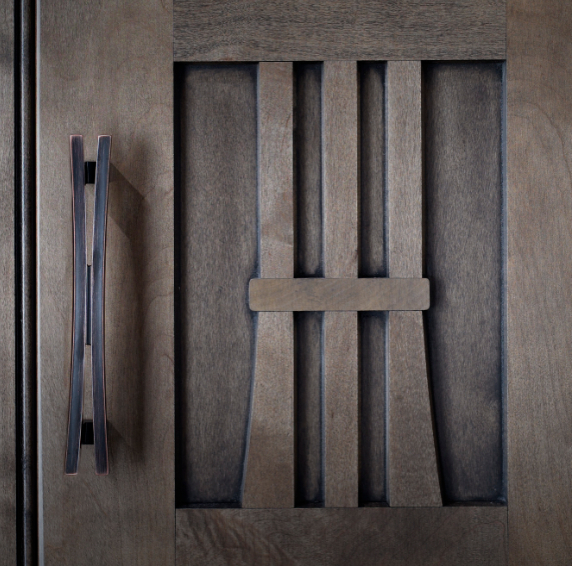 In addition to white and black, three wood finishes are available. Cast silver-tone pulls—tastefully modern and modest—are included. With its French doors happily exempting it from being another a pro-style clone, this range caught the judges' collective eye; its performance credentials sealed its category-winning status. The center portion of the cooktop can be customized to include a 12-inch French top, a griddle, a charbroiler, or simply another pair of burners. 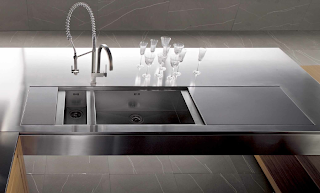 From a chef's perspective, the ergonomic efficiency of an in-line cooktop is beyond reproach—its linear layout eliminates reaching over hot pans and open flames. 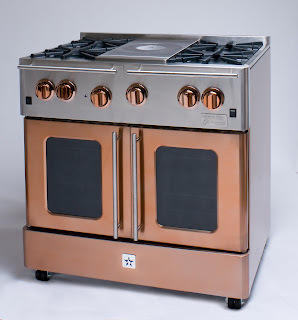 This 42-inch model, anchored by a 18,000 Btu burner that's offset to accommodate large-diameter pots, displays a laudable mix of elegant form and ultimate functionality. 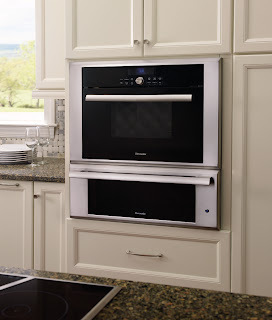 Steam ovens are a boon for the health-conscious cook, and convection ovens appeal to those who feel the need for speed, but eschew the microwave. This innovative appliance delivers both cooking modes—not only individually, but also in combination. The oven features a 1.4-quart water reservoir, which means there's no need to run a dedicated plumbing line. A WiFi-enabled LCD touchscreen perches above the water and ice dispenser on this refrigerator—a valuable feature when the iPad goes missing. 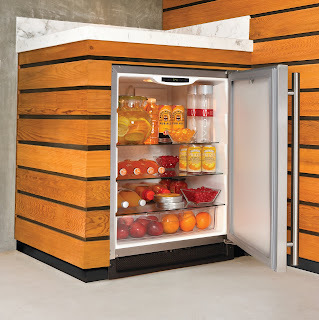 The counter-height drawer, which can be set to one of four temperature settings, acts as a mini fridge-within-a-fridge; stocked with snacks, sodas or school lunches, it keeps curious kids from 'investigating' the main cooler compartment. The better to see you: LED light columns brighten the inside of the cabinet of this 36-inch model; its two freezer drawers are also illuminated. Digital controls are located up front and are easy to read. 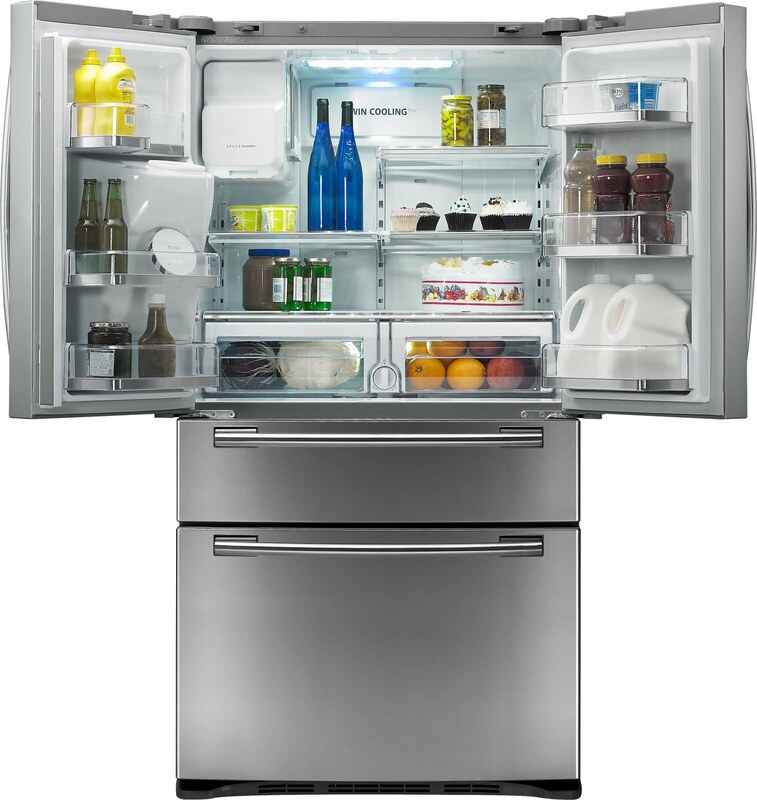 The fixation on freshness doesn't stop with the three crisper drawers [one of which usefully spans the full width of the fridge], as even the ice maker gets into the act by using filtered water. A vivid, interactive LCD control panel is set into the top edge of this dishwasher's door. 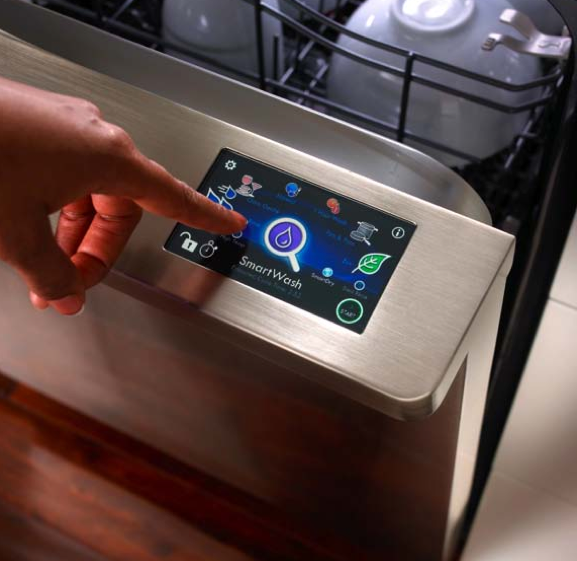 More than lending an uncluttered look to the appliance, the well-designed interface is genuinely intuitive to operate: just scroll and tap your way through various cycles and settings. A three-piece jointed spray arm sends water well beyond the typical circular zone, resulting in more thorough cleaning. Blending convenience with efficiency, the Maxima offers a couple innovative options on adding detergent to the wash. One sprays the soap evenly across the top of the clothes; the other, a feature dubbed Optimal Dispense, doses out detergent throughout the fill process, automatically calculating the amount and release time. Of particular note in this latest generation of the laundry-room stalwart is the EcoBoost feature. 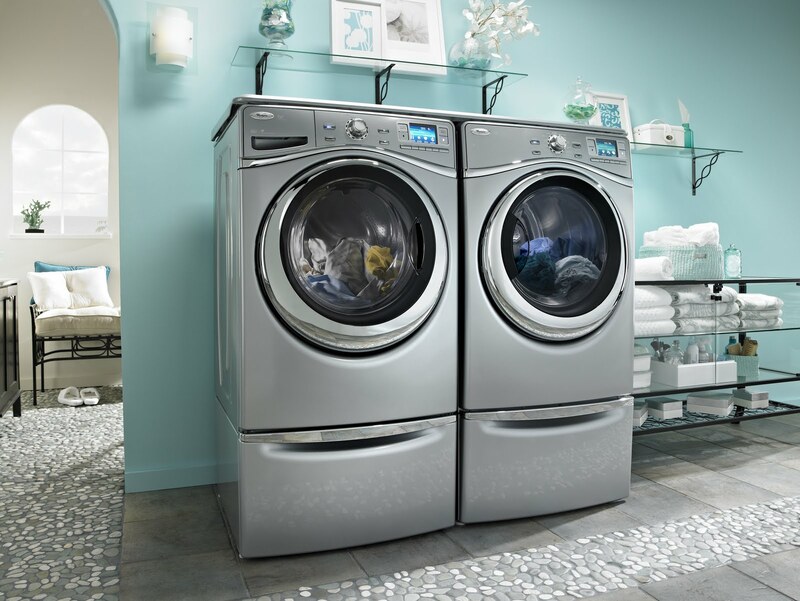 When activated, it lowers the wash-water's temperature and increases agitation time, resulting in water and energy savings—letting households clean up in more ways than one. This ultra-quiet [110 CFM at 0.7 sones] bath fan doubles as an atmospheric night light, casting a soothing blue glow over the room—much easier on sleepy eyes than bright white incandescent bulbs. 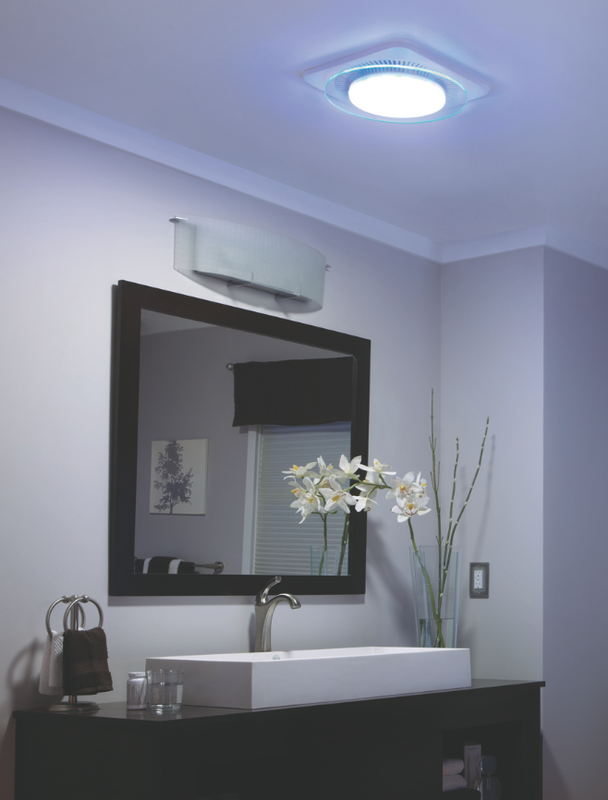 The azure LED can be operated independently of the primary fluorescent lamps. 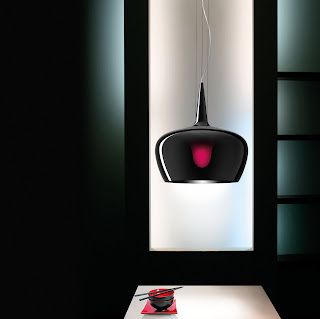 This hood's technical specs are on a par with its head-turning appearance. Available in ducted or non-ducted versions, the 400 CFM vent utilizes perimeter-capture design to maintain its sleek lines. 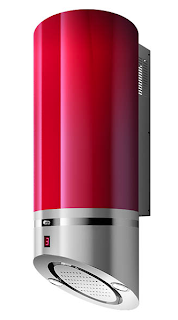 The wall-mounted cylinder is finished in scarlet powder-coating. These stainless steel basins disappear under sliding counter panels; depending on your point of view, such functionality either increases the area of work surfaces in the room, or aids and abets those who on occasion may keep a less-than-immaculate kitchen. This sink transcends the restrictions of typical double-bowl models by virtue of a six-inch-tall wall separating the ten-inch-deep basins: it accommodates the long handles of large cookware items. The asymmetrical design is reversible. 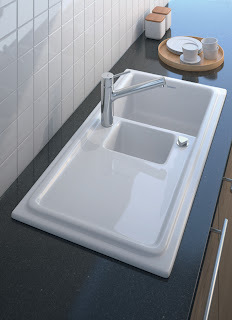 Fabricated of durable Silgranit II, the sink is available in seven colors. 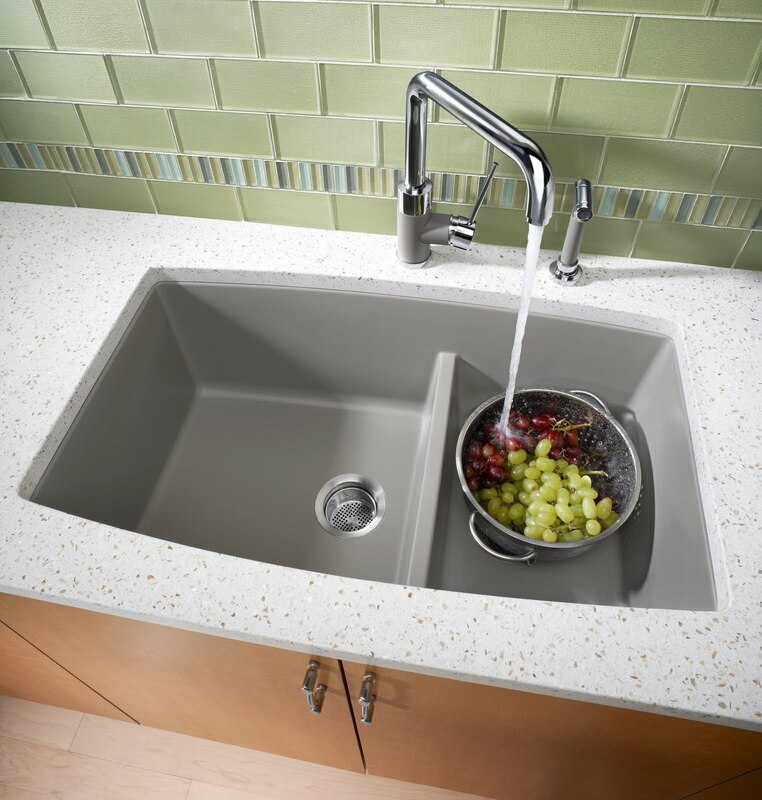 In three sizes and five colors, this ceramic sink features a thoroughly contemporary drainboard; grooveless and gently sloped, it acts much as a countertop. 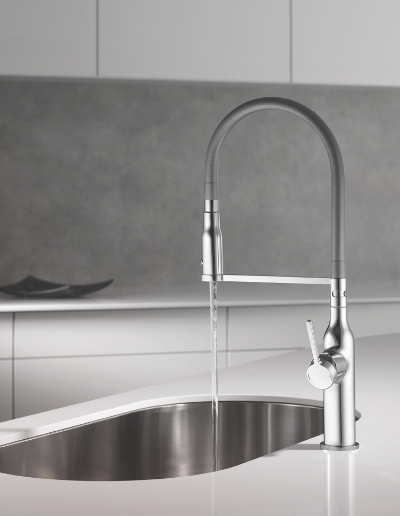 A pop-up waste control, which eliminates the need to plunge your hand through dirty water to open the drain, is de rigueur in Europe; the Cassia tests the American market on this convenient feature. A rubber-like material with a shape-retaining 'memory' allows the SIN Highflex to be freely focused by the user, without having to wrestle the spray head back into place. 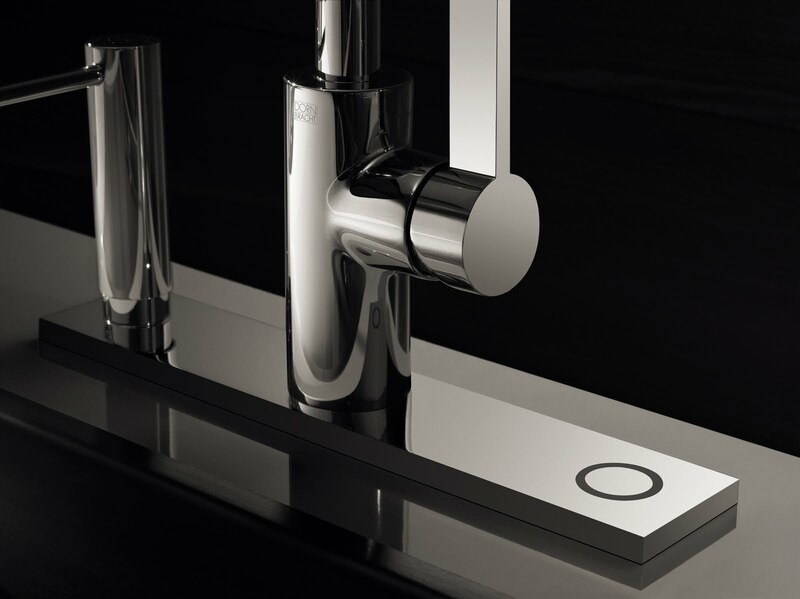 Coupled with the faucet's ability to swivel a full 360 degrees, it's as functional as it is fashionable. This pro-inspired faucet has adapted several design details to better suit residential kitchens. Sheathing the hose in an easy-clean, close-coiled steel spring and adding a magnetic docking feature simplify use. 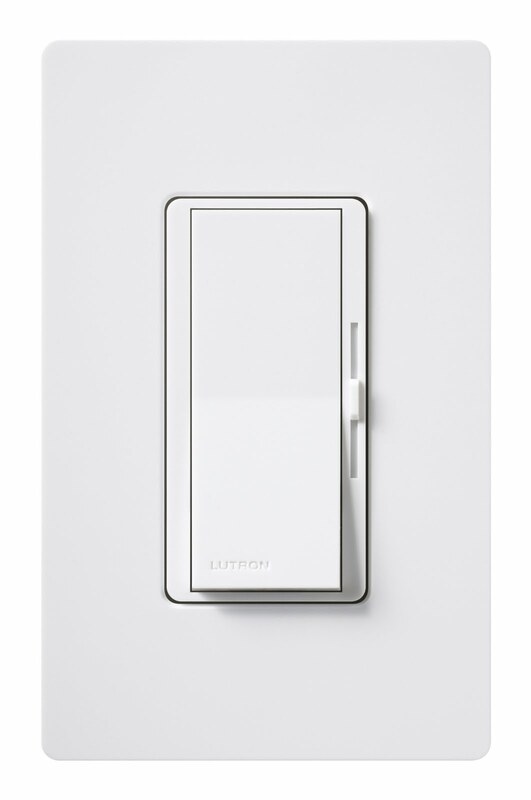 Debunking the notion that garbage disposers can only be activated via an often out-of-reach—and always out of place, aesthetically speaking—toggle, the Air Switch is an elegant alternative. 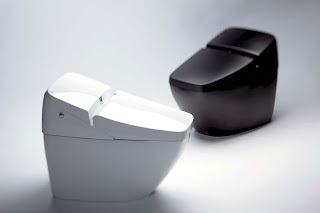 Available integrated into selected product lines, it is also offered as a stand-alone fitting, with either a square or round housing, to mount on the wall or counter. How refreshing—a bathtub that doesn't look like yet another cracked egg! The offset rectangular tiers display an angular profile, belying the contoured lumbar supports within. 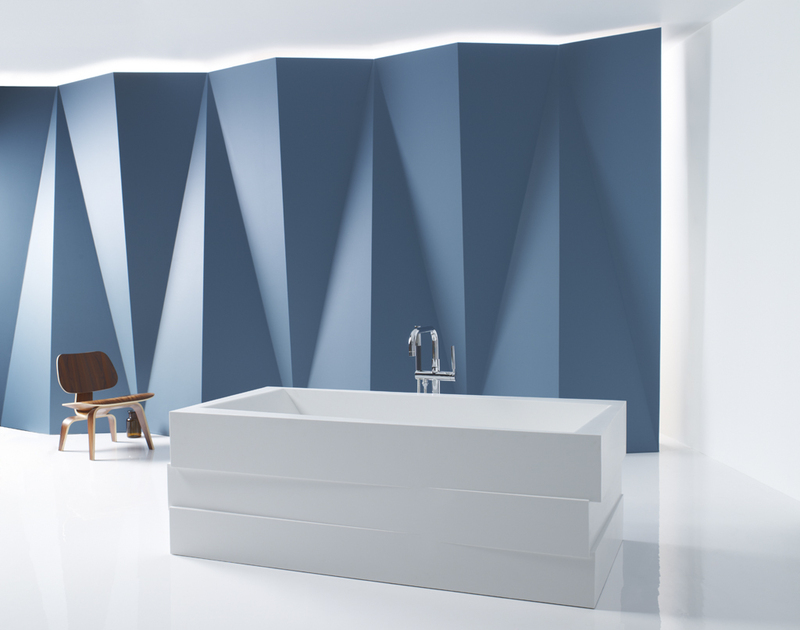 The drain cover is cast from the same solid-surfacing material that comprises the tub, avoiding the visual interruption chrome would create. 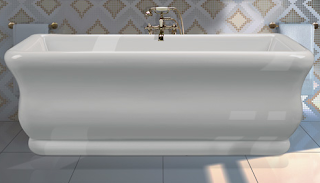 Proving that it is indeed possible to improve on a classic, this cast acrylic tub has ergonomically correct backrests built into the bathing well. 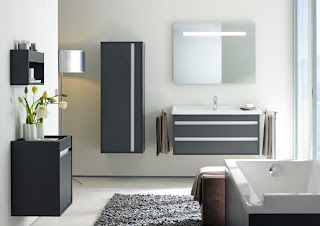 Pampering options include a heated tub interior, air jets and underwater LED lighting. A wireless remote control puts users in charge of a full complement of features—three wash modes, air and seat temperature, lighting and lid/seat operation. The stainless steel spray wand and nozzles are automatically cleaned before and after each use. The upswept styling and metal-edged detail dodges the usual monolithic look of comparable models. 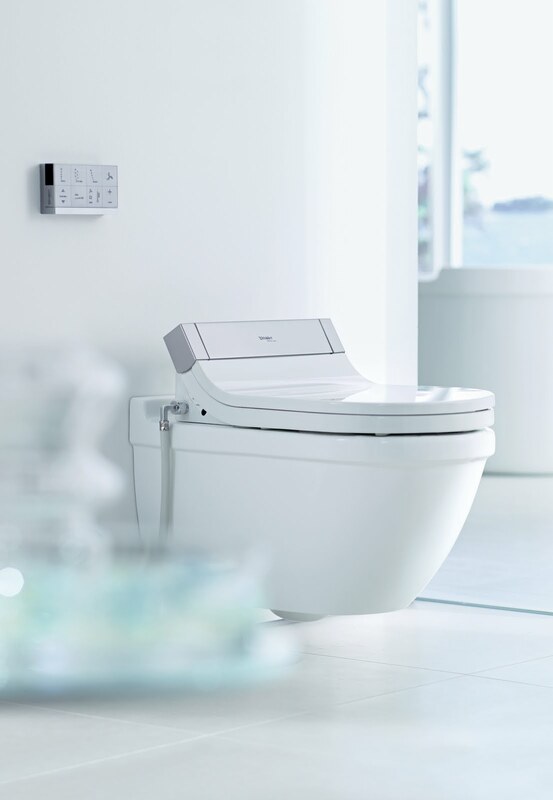 An SD card that pipes the music of your choice into the room and a two-step air-freshening function that's triggered before and after each flush distinguish this sleek commode. It's the sole bidet-featured toilet that's available in black. The touch-glass control panel on this appliance protects against the corrosive salt and dirt that can collect around and damage conventional knob controls. 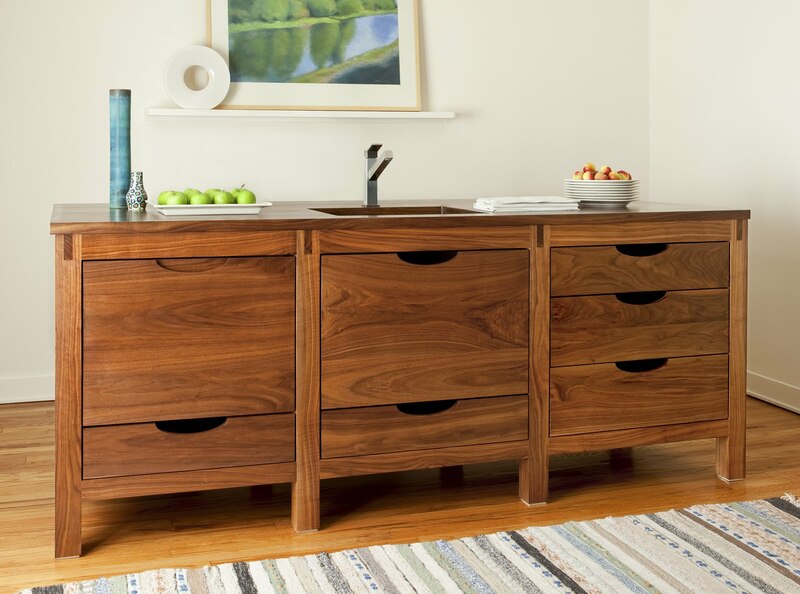 It can hold up to 168 beverage cans or 96 bottles—quite enough for a thirsty crowd—and is lockable. 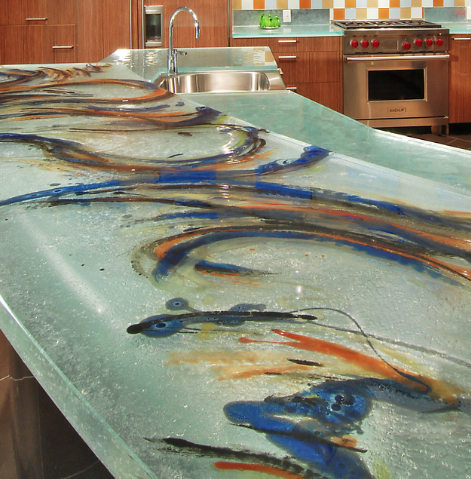 From a functional point of view, glass has a lot going for it when used as a work surface; it's scratch- and heat-resistant. 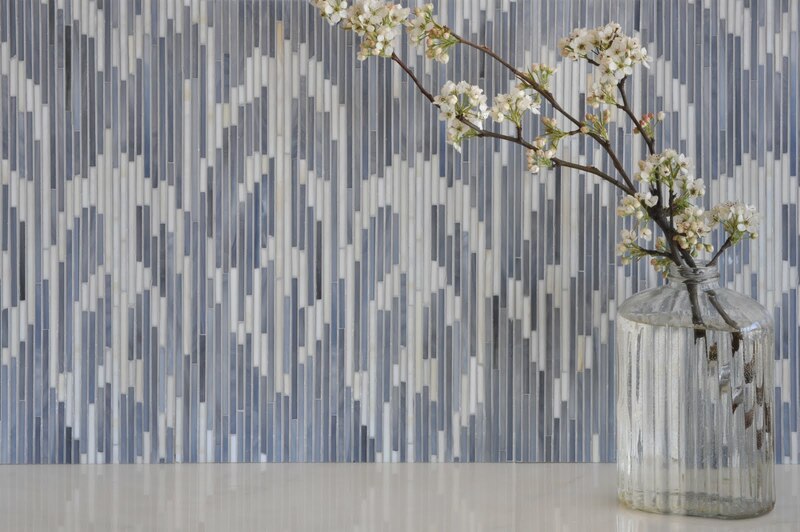 When these properties are paired with the material's artistic potential, it results in custom expressions of color, texture and form. 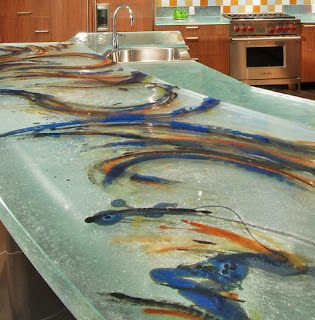 In ordinary laminates, photographic images of stone or wood are bonded with paper and resin to create the surfacing. This line of products, which is Greenguard certified, incorporates actual wood veneers into the material. 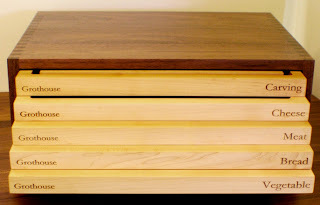 Twenty-two different species are offered, from ash to zebrano. 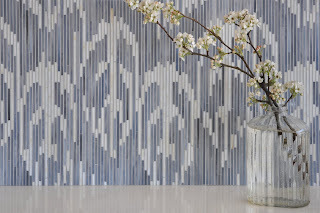 The timeless shapes and patterns in this collection are updated with a modern, 12-color palette. The field tiles are marked by subtle pools of light-catching glaze, indicative of hand-crafting. 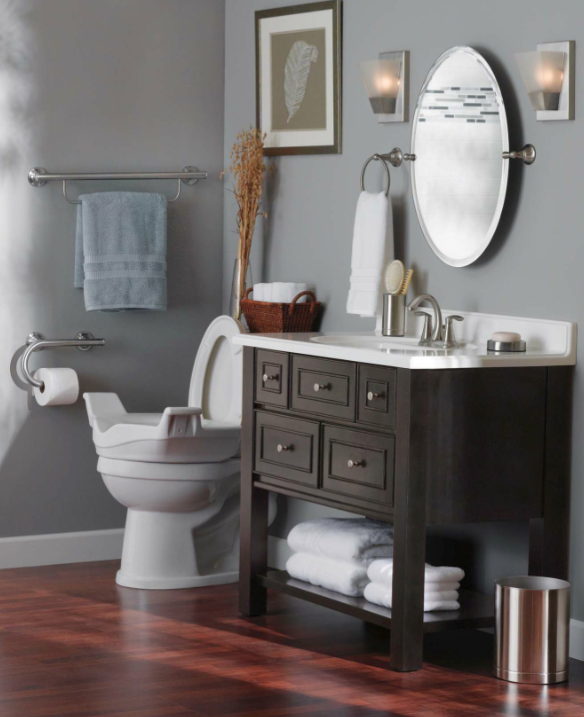 This smartly conceived collection of towel bars, tissue holders and a shower shelf not only provides useful storage in the bath, but as they're specially designed to double as grab bars, they bring security where it's needed. 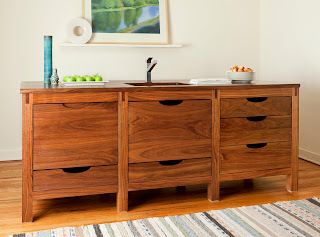 Too often, storing cutting boards is haphazard; this solution is anything but that. Laser-cut labels on the edge of each board identify its use—a more design-conscious approach, the judges thought, than color-coding. Surfaces can be custom contoured, and the Box itself is available in a veritable forest of 60 different woods. A dramatic—dare we say spellbinding?—light emanates from this blown-glass lamp, which was designed by Marco Piva. The moody suspension fixture is available with black, gray, white and mirrored crystal shades. Compact fluorescent lamps and LEDs are undeniably energy efficient, but fall short in the ambiance department; they're notoriously difficult to dim and are prone to abruptly turning completely off. This dimmer control features technology that targets this problem. What's more, in addition to CFLs and LEDs, it's also compatible with halogen and incandescent light bulbs. Understated and elegant, these Asian-influenced pulls can enhance either traditional or contemporary cabinets. 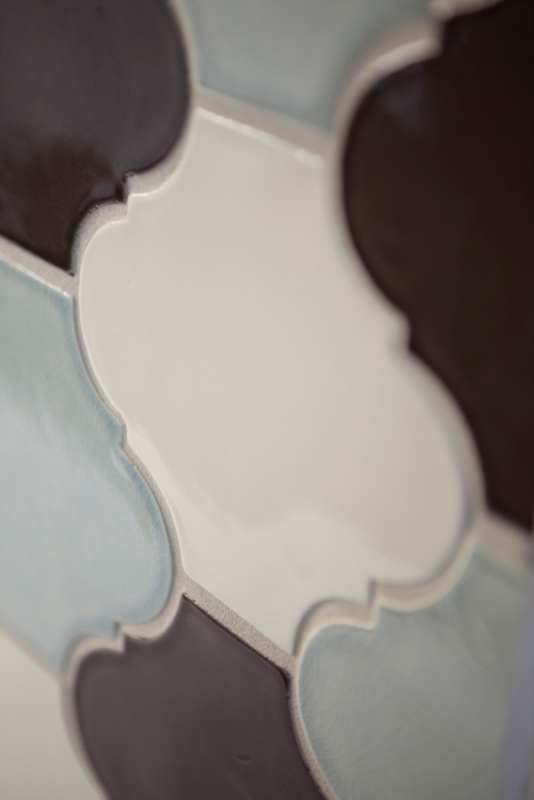 The selection of eight finishes increases their versatility. 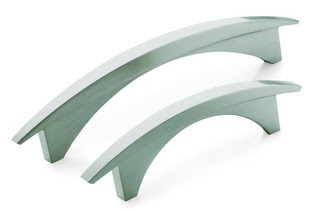 More graceful than many modern hardware collections, these silvery arcs boast a surprising heft. The Satin Nickel finish works with all manner of wood tones and solid-color cabinets with equal ease. 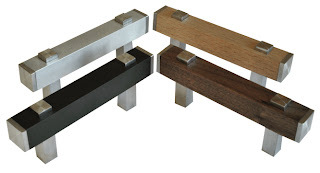 Frank Lloyd Wright's signature square is a key element in this family of door and drawer pulls, which was developed in partnership with the Frank Lloyd Wright Foundation. Beech and walnut woods, as well as oil-rubbed bronze and solid stainless steel, comprise the collection.